SHREDDAGE 3 STRATUS - Now available from Impact Soundworks!!! Discussion in 'COMMERCIAL Announcements' started by zircon_st, Oct 2, 2018. Shreddage 3 Stratus - Available Now! 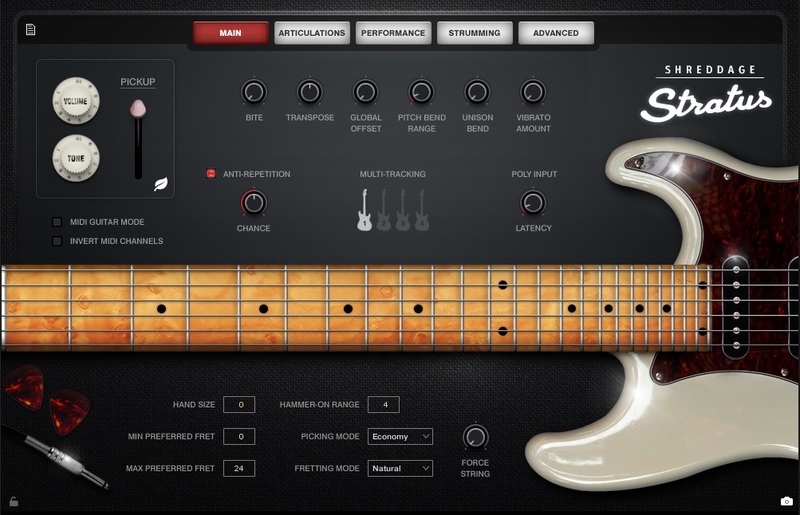 Impact Soundworks' Shreddage 2 guitar has been our most popular virtual instrument since its release in 2012. Over the years, we've refreshed and updated it several times, and brought two other guitar models to the same engine. But now, it's time for the next generation! We have created an entirely new virtual guitar engine, scripted from the ground up with cutting-edge tech. S3 harnesses the full range of Kontakt 5.7's features to deliver stunning playability, realism, and customization. Not to mention, it looks badass! 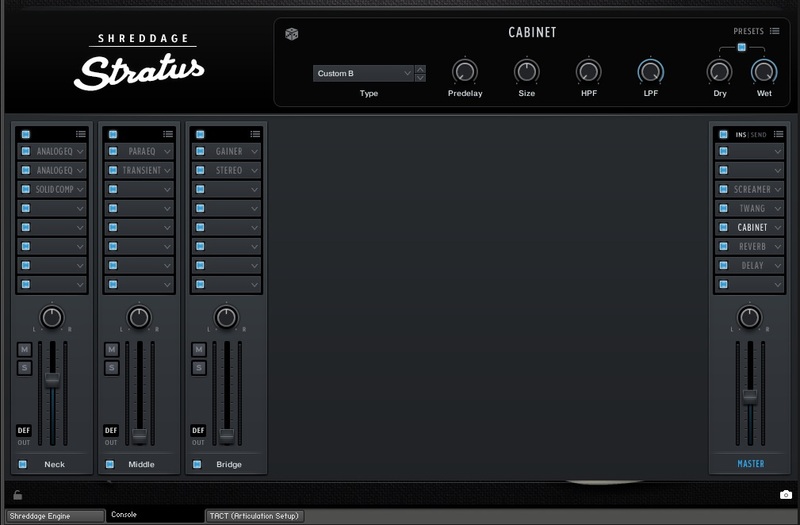 The S3 engine will power newly-recorded guitars starting with Stratus, coming later this month. Older guitars on the S2 engine, as well as Archtop and Shreddage Bass 2, will also be ported to S3. Debuting in Shreddage 3 Stratus is our new CONSOLE tab. This is, in our opinion, the most powerful FX mixer in the Kontakt world with unprecedented amounts of control and customization at your fingertips. 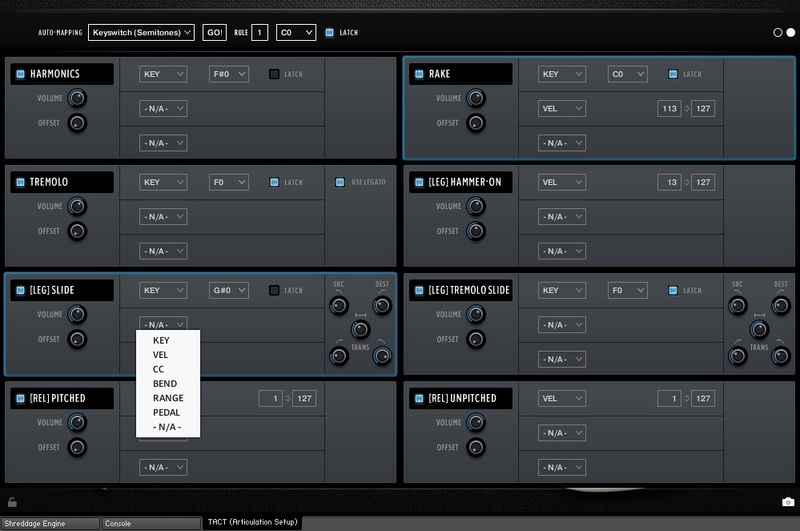 FX chain presets are portable between instruments! "Total Articulation Control Technology" (TACT) has appeared in a number of ISW releases, giving you - as the name suggests - complete flexibility over how articulations are mapped and triggered. Individual techniques could be mapped to velocity, key range, key switches, midi CCs or other methods, with the ability to create multiple 'rules' and mapping presets quickly and easily. Naturally, for S3, we have given TACT an upgrade as well! We've kept all the same great functionality from v1.0 but expanded the look to be far less cramped. Legato controls are more flexible as well, giving you extended tweaking capabilities for the origin, transition, and destination samples. All of these incredible features are nothing without a killer set of samples, and we're excited to announce the first guitar of the S3 engine is a classic American sound that has long been missing from the ISW lineup. Stratus is just as deep-sampled as earlier guitars, offering a full range of sustains, palm mutes (with multiple layers), powerchords, tremolo, harmonics, legato, chokes, rakes, and releases. We've also captured some brand new articulations such as Staccato Snaps and Tremolo Slides that are essential to this type of guitar, and simultaneously recorded three pickups (neck, middle, bridge) which give you three very distinct tones to work with. Shreddage 3 Stratus is available NOW for MSRP $149, compatible with Kontakt Player 5.7+ and NKS. Full version of Kontakt is NOT required! Owners of any Shreddage 2 series guitar will get a $20 coupon in their Deals area, plus heavily discounted upgrades on S3 versions of S2 guitars. We can't wait to hear what you do with S3 Stratus! LinusW, Casiquire, Mike Marino and 8 others like this. the gui Looks delicious! and I'm sure, the sound will be that, too! I'm impressed with your thesaurus skills. But not "Groundbreaking"? I only purchase Groundbreaking these days. I might make an exception for this. Casiquire, JW, Mike Marino and 17 others like this. Looks really good. Will certainly be picking this one up! Lovely GUI!! Looking forward to more info. Wow! Thanks for this, Andrew...my favorite guitar of the ages...and I look forward to exploring the new magic you apply to this baby! I use superlatives only when I'm 100% confident they're deserved. chimuelo, Vastman, Mystic and 3 others like this. I use superlaxatives too... errr... wait a moment. All the guitars will be redone, AFAIK. will there be any TACT implemantation to Bravura or the plucked ethnic instruments as well any time soon? AFAIK it's not anywhere in the pipeline, so not "any time soon" for sure. Also I feel that Bravura wouldn't gain that much by having TACT implemented, but I could be wrong. txh for the info !!!! Right. I would like to see them do a brand new sampling session with the sg used in Shreddage / Classic.